Nick Watters brings to clients of the firm more than 30 years of professional experience in the philanthropic use of planned gifts in estate planning through life insurance, charitable gift annuities, and charitable trusts. Nick has his ChFC (Chartered Financial Consultant), AEP (Accredited Estate Planner), and CFBS (Certified Family Business Specialist) designations and provides high-quality financial strategies in the planning of charitable gifts designed to help maximize financial benefits to nonprofit organizations and tax-reduction strategies to donors. 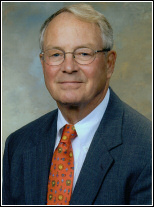 He has served on numerous nonprofit boards throughout the United States. Nick earned a Bachelor of Arts degree from Bowdoin College and has served in the United States Marine Corps.